Accomplished musicians all, Fish’s band immediately impress in the intimate confines of the Picturedrome. Tight knit, yet always flexible and fluid, Robin Boult’s guitar playing sends shivers down the spine on more than one occasion. Steve Vantsis’ bass is perfectly pitched and brilliantly unfussy. These men have the warm and calm air of people who know their craft intimately and have nothing to prove, yet never take their audience for granted. The big man himself’s voice is in equally fine fettle, showing no obvious signs of the surgeries and illnesses that have kept him off the road and out of the studio in the recent past. There is something to be said for music of an epic scale being played in a smaller setting. Occasionally during Fish’s set, and in its more synth-heavy moments, one is minded to think of cosmically minded musicians such as Pink Floyd. But where it would be possible to argue that Floyd’s brilliance is occasionally lost in the cavernous enormo-domes of the world, Fish and Co’s compositions are never swamped by their surroundings. A perfect example would be the central section of tonight’s gig, ostensibly a showcase of the ‘High Wood’ suite at the heart of Fish’s most recent album, A Feast Of Consequences. “Don’t worry,” he says, “I won’t speak much for a while after this” as he tells the story of his grandfathers’ involvement in the 1914-18 war and some of the extraordinary coincidences that have since echoed through his own life and inspired the music and lyrics. What follows is simply breathtaking, the band making their way through “High Wood”, “Crucifix Corner”, “The Gathering”, “Thistle Alley” and “The Leaving” with the sort of effortless simplicity that only comes from years of hard graft and the development of finely honed skills. Gavin Griffiths on drums and John Beck on keys come in to their own during the suite, providing both subtle texture and explosive power as the songs demand. It feels like some of Fish’s most inspired and brilliant music, and it’s delivered by a peerless band of musical brothers. Always true to his word, Fish and his fellow colleagues then power through renditions of Marillion’s “Slàinte Mhath” and solo track “Big Wedge”, bringing a welcome change of pace and keeping the audience enthralled. Arguably the evening’s most intimate highlight then follows as, introducing the track with thoughts on public disenfranchisement and political engagement, the opening bars of “Vigil” ring out through the old theatre building. As the music develops, Fish comes to the front of the stage, clambers over the barrier and walks in to the crowd, shaking the hands of everyone he passes and greeting them with warm smiles. He keeps on until he is standing in the middle of the hall and delivers the song just inches from his crowd’s faces, this reviewer included. A spontaneous moment or carefully crafted with military precision? It really doesn’t matter. The physical proximity and warm intimacy chime perfectly with the song’s lyric: “Just quieten down for a voice in the crowd / I get so confused and I don’t understand / I know you feel the same way / You’ve always wanted to say / But you don’t get the chance / Just a voice in the crowd.” Live rock music simply doesn’t get any better. “Heart Of Lothian” and encores of “Incubus”, “Blind To The Beautiful” and “The Company” later, and the Yorkshire faithful shuffle out in to the rain soaked night, grins fixed firmly on faces and chatter rising high in to the air. This is one Fish that it’s been well worth waiting to catch. 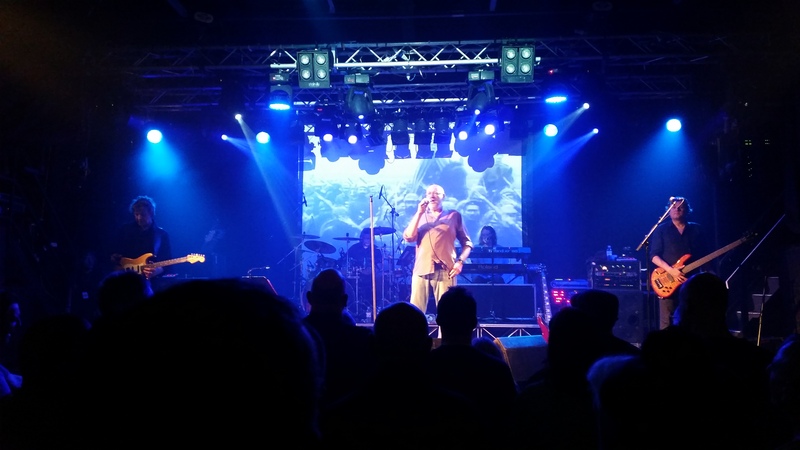 Find out more about Fish’s current work and live dates at the official Fishheads Club website.